Graeme McDowell has no intention of going down in Ryder Cup history as a good loser. And the go-getting Portrush star will be using all the gamesmanship tricks he has picked up over the years to make sure he makes a winning start to his Ryder Cup career. Hoping to form a Celtic Tiger partnership with Padraig Harrington, he said: "I hate to lose like the next guy even though losing is part of the job sometimes and you’ve got to take the rough with the smooth in this game. "But I think match play really suits me because you can put the blinkers on and get aggressive. I’ve always enjoyed match play. "I played a lot of it growing up but not so much in the last few years. I am looking forward to getting back into that match play frame of mind, it’s a different space, there’s no doubt. "There is no doubt that a little bit of gamesmanship goes on. Guys have their own views on how matchplay gamesmanship works. Giving putts, not giving putts. Slow playing the guy. Finishing out your putt on the green. I am looking forward to getting the old matchplay feelings going. "I was pretty good at it. That's what I'm most excited about - getting that old matchplay intensity back. I can't wait to get alongside my partner and go after the other two guys." Partnering Open and US PGA champion Harrington would be ideal for McDowell, who confessed that he wants to be "handcuffed" to the Dubliner for the week. He wants to keep up Ireland's amazing Ryder Cup record and go down in history with the rest of Ireland's Ryder Cup heroes such as Darren Clarke, Paul McGinley or Christy O'Connor Jnr and a partnership with Harrington could see him play all five matches. He said: "I think the Ryder Cup is in every Irish golfer’s heart. The affinity we’ve had with the Ryder Cup over the years, the players who have holed the winning putts and, obviously, Darren at the K Club. "The Ryder Cup is part of me and it’s something I’ve always dreamt of doing. I really set my stall out to play a couple of years ago and made it my goal to get to Valhalla. Now I’m here, I’m certainly going to enjoy myself." Disappointed that Darren Clarke was left out in the cold by skipper Nick Faldo, McDowell knows that he will have to get in the queue behind the rest of the team if he wants to team up with Harrington. McDowell said: "If I get myself handcuffed to Harrington for the week then that would be pretty cool. He’s obviously the best player in the world on two legs right now. "I practiced with him yesterday and I’m going out there with him again today for nine holes. Maybe that bodes well, maybe I’ll get a game with him. "If I want to play as many matches as possible I might want to get myself paired with a guy like that and win the first couple of games. I’m here to experience the whole deal and play as many games I possibly can at the weekend. "I think guys are trying to get close to Padraig this week and I'm certainly no different. What the guy has done the last three or four months or the last 15, 16 months, winning three majors, he's probably the best player in the world right now who is fit." The problem for McDowell is that Engand's Paul Casey looks like Harrington's likely partner in tomorrow morning's foursomes due to the similarity between their games. "I'd love to play with Padraig," Casey said. "I think would be a good pairing. Any time you can play with a double-major champion, a double-major champion from one year, that would be very, very nice." Harrington has said that he'd prefer to partner a playing with a similar game to his own in the foursomes and a long hitter like Casey, who doesn't always hit the fairway, would fit the bill nicely. Casey added: "I guess I am slightly erratic. But my greens in regulation percentage is fairly high and he's an exceptional putter so I think that could be a very, very good combination." McDowell has won twice this year and his record as a born-winner has not gone unnoticed by the likes of veteran Lee Westwood, who admires the Ulsterman's killer instinct down the stretch. "When he gets a sniff of a title and gets under that kind of pressure, he invariably comes through," Westwood explained. Aggression will be vital this week on a course that has been set up to produce birdies and eagles galore. And that's just fine by McDowell, who can't wait to be let off the leash. He said: "You can play a lot more aggressively and you don't have to stick a six or seven down at the end of a hole if you hit it in the water. You can fire at pins and make eagles and birdies and be a bit more aggressive. "There are some pretty key holes out there and there's going to be certainly couple of potentially drivable par 4s, No. 4 and 13 which will be drivable, and the par 5s will be key. Three out of the four are pretty reachable. There will be eagles and birdies and all sorts of stuff flying around." Matchplay wizard Graeme McDowell hopes he can get handcuffed to Padraig Harrington for the rest of the Ryder Cup. The Ulster rookie, 29, is bursting to play all five games at Valhalla and he reckons that having Harrington as his fourball partner will quickly revive the matchplay know-how that made him a terror to play at amateur level. Ryder Cup rookie Graeme McDowell wants to ease Nick Faldo’s selection headaches with a storming performance in Germany. The Ulsterman, 29, tees it up in the Mercedes-Benz Championship in Cologne with next week’s Ryder Cup obsessing his thoughts. 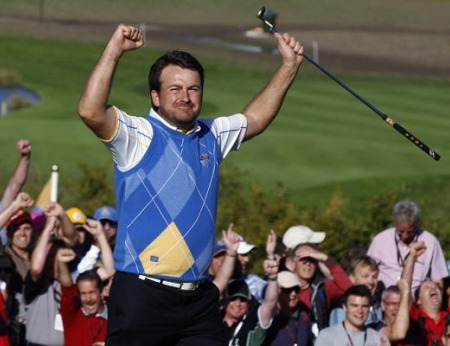 Graeme McDowell became the fifth Irish player to clinch the winning Ryder Cup point for Europe with a sensational 3 and 1 victory over Hunter Mahan in the final singles. 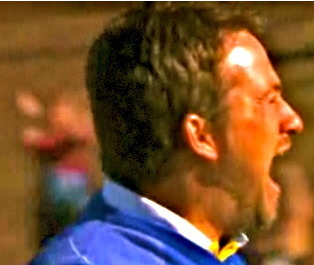 Graeme McDowell embodies everything that you might want in a Ryder Cup player. Picture via csmonitor.comPortrush pitbull Graeme McDowell wants to savage the USA next week and live up to his billing as the Irish Seve.